Thank you Circulon for sponsoring today’s recipe. As always all opinions and experiences are my own. Raise your hand if you love a quick and flavorful dinner? I partnered with my friends at Circulon to create 3 dinner recipes that are perfect for just two people. 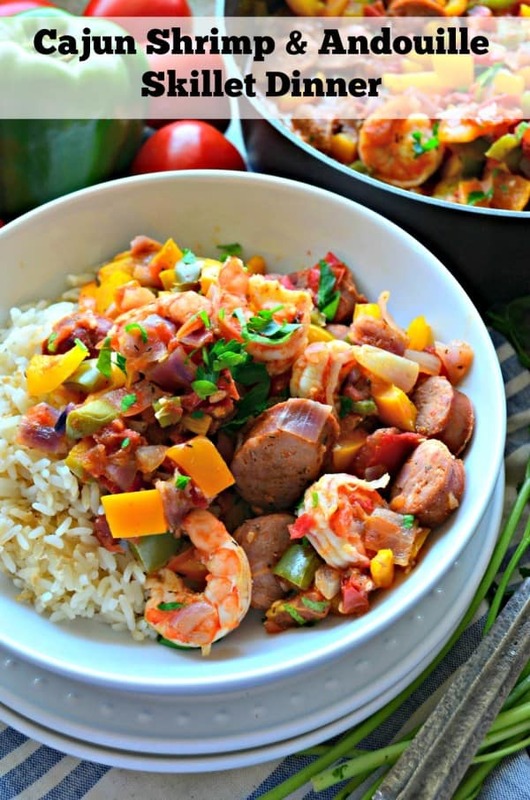 In all fairness this recipe for Cajun Shrimp & Andouille Skillet Dinner makes enough for 4. You can eat it for dinner and then take it for lunch the next day. This meal reheats beautifully and tastes even better the next day! It’s wedding season and that means couples are updating registries and guest are buying gifts. Yesterday, marked NINE years since I said “yes” on Maegan’s Bay in St. Thomas while on vacation. Crazy how quickly life flies by. When we were registering for gifts we actually registered for a Circulon Cookware Set along with a few loose stock items. Circulon has been in my kitchen for 9 years and I’m happy to partner with them. In my opinion, they make the best cookware! For this Cajun Shrimp & Andouille Skillet Dinner I used the Circulon Symmetry Chocolate Hard-Anodized Nonstick 11-Piece Cookware Set. I love how quickly this meal comes together. You cook the rice while the sausage and fresh vegetables reduce down. Add in the fresh shrimp and a few fresh herbs and voila dinner is done. And all under 35 minutes from start to finish! Bright and fresh seasonal vegetables combine with spicy Andouille sausage and wild jumbo shrimp, making this skillet dinner ideal for an easy weeknight meal. In a Circulon® Symmetry Chocolate 3-Quart Covered Sauté Pan, place the olive oil, diced red onion, minced garlic, and Andouille sausage in the skillet. Cook on medium-high heat for 5 minutes, stirring occasionally. Get the full recipe over on Circulon. The Pan-Roast Chicken and Spring Vegetables with Salsa Verde recipe is the first one i would like to try. Beautiful cookware! Well I love anything Cajun! What a fantastic recipe! This looks delicious and easy! Your recipes are always inspiring! the mint dark chocolate marshmallows sound really good! I’d like to make the Tomato Bacon Capellini using ingredients from my garden. I want to make the Beef and Chorizo Empanadas! They sound so delicious! Beef and Chorizo Empanadas look good to make. I would love to try the Tomato Bacon Capellini. I would love to try the Egg Frittata with Roasted Broccoli and Aged White Cheddar. I would love to try the Beef and Chorizo Empanadas! I’d like to try the super tea and the chocolate orange almond torte. I would love to try Martin Yan’s Potstickers. I would like to try the Beef and Chorizo Empanadas! I want to try the Parisian Roast Chicken recipe. I want to make the Grilled Chicken Sandwich with Mango, Avocado and Creamy Sriracha Sauce. I would make the Tomato Bacon Capellini because it sounds so good. I would like to try the No-Knead Overnight Bread recipe. I do believe I have shrimp and sausage in the freezer-Cajun dinner tonight! Oh I would love to make their recipe for the Chicken Pad Thai! I love having it when we go out to eat, but have never tried making it at home. Looks delicious! Grilled Chicken Sandwich with Mango, Avocado and Creamy Sriracha Sauce sounds yummy! I’d love to try the Grilled Chicken Sandwich with Mango, Avocado and Creamy Sriracha Sauce recipe! 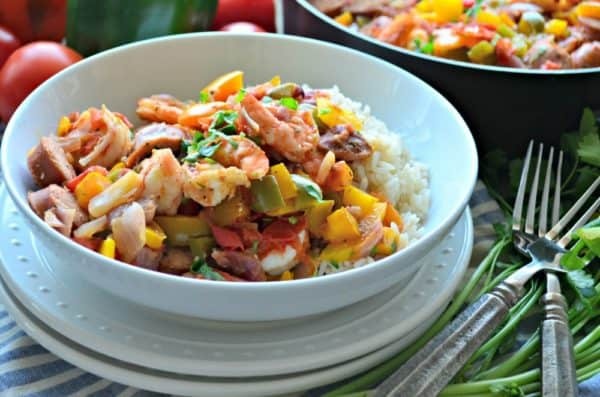 Since my family loves shrimp, I would love to make the Cajun Shrimp & Andouille Skillet Dinner. I want to make the chocolate orange almond torte. I would love to make the Thai Tacos! I would love to try the Sweet Potato and Black Bean Chili. I want to cook the Cajun Shrimp & Andouille Skillet Dinner. Wow, the Beef and Chorizo Empanadas look absolutely delicious! What a cute picture and the skillet dinner looks delicious! Shrimp is my favorite so naturally I would love this! I would love to try the Grilled Chicken Sandwich with Mango, Avocado and Creamy Sriracha Sauce! Sounds so delicious! I’d like to make the Stovetop Wild Rice Stuffing. I’d love to try the Beef and Chorizo Empanadas! I would love to try the Lemon Bacon Shrimp Scampi! The irish soda bread with maple sounds so good! I’ve been wanting to make some Irish recipes ever since St. Patrick’s Day. The first thing that I would like to make is an Asian omelet. The soy sauce sounds so good in it. I have never been able to make a good omelet but i think that using one of these pan I will be able to finally make one. I would love to try the Ricotta Gnocchi with Browned Butter and Fried Basil recipe. I would like to try the Chocolate Orange Almond Torte. I want to try the Egg Frittata with Roasted Broccoli and Aged White Cheddar. 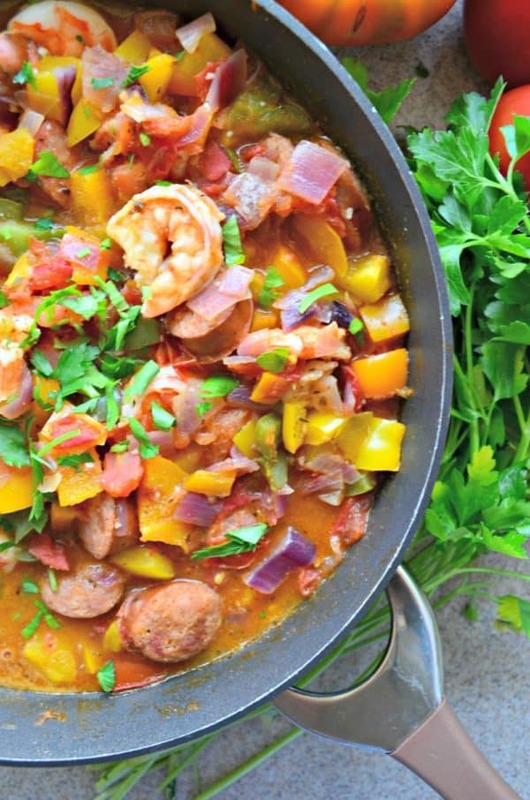 The Cajun Shrimp & Andouille Skillet Dinner sounds delicious! I’d love to try the fettuccine alfredo for 2 recipe! I’d love to try and make the Beef and Chorizo Empanadas! Would love to try the Lemon and Coriander Roast Chicken recipe as well as this one – LOVE shrimp and this looks so good! The Beef and Chorizo Empanadas sound really good! because I love Cajun food and New Orleans! I would try any of the Cajun recipes, especially if they include shrimp. The recipe from above is definitely my taste. I would love to try the tomato bacon capellini Or Lemon Bacon Shrimp Scampi. With Bacon you can’t go wong. I would like to try Fresh Veggie Sandwich. I think the Mint Dark Chocolate Chip Marshmallows sound amazing! I’d love to try the Mint Dark Chocolate Chip Marshmallows! I’m imagining those in a S’more! I would like to try the Fettuccine Alfredo for Two. I would so enjoy trying the Ricotta Gnocchi with Browned Butter and Fried Basil recipe. I would first make the Tomato Bacon Capellini.